Noel died from wounds on the 12th July 1917, received whilst in the trenches at Vimy. He was 21 years old. Noel Cecil Sarson was born in Liverpool on the 23rd May 1896. He was possibly an orphan, as the 1901 census records him as a 4 year old boarder at the home of Thomas and Elizabeth Williams and their daughter Jane, in Church Street, Rhuddlan. Mr Williams’ occupation is recorded as, “carter on farm”. The Rhuddlan National School admissions register [Ancestry], records Noel’s admission to the school as the 13th November 1899. It confirms his date of birth and also his address in Church Street. On the 21st February 1907, Noel sailed from Liverpool on board the s.s.Dominion, arriving in Portland [Maine USA] on the 5th March. Possibly a portend of engagements to come, the s.s. Dominion had been built as the s.s. “Prussia” in Belfast for the German Hamburg America Line in 1893, but subsequently sold to British interests in 1898 and renamed [Wikipedia]. According to the US Immigration Passenger Manifest, his fare had been paid by “Dr Barnardo Homes” [Ancestry]. He was described as being in good health both mentally & physically. Noel was one youngster amongst many on that voyage, in the same situation. All these children were being sent to Canada under the British Home Children scheme, which commenced in 1869 and finally ceased in the 1960s. Under the scheme, many UK Children’s charities, felt that orphaned, pauper and abandoned children, might have a better start to life if placed with families in the developing colonies. Highly principled in its origins the scheme might have been, but it was open to abuse and frequently was, both by the host families and sometimes the charities themselves. Canada was the first country to accept these children, a long time later Australia, New Zealand and South Africa became recipients. 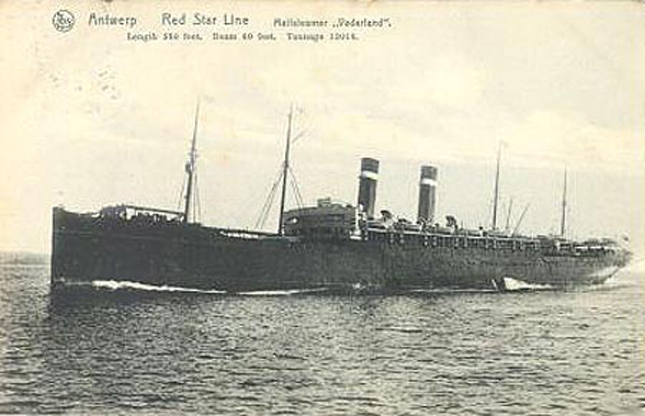 From Portland, he would have been sent by rail to a Canadian reception centre, possibly Toronto or Peterborough, before being placed out. The 1911 Canadian Census [Ancestry] records him in the household of Farmer, 64 year old John & Madena Oliver at 18 Percy Township, Dartford Village, Northumberland County, Eastern Ontario. He was 14 years old. His relationship to John Oliver was given as “adopted”. It recorded his nationality as Canadian, that he had been at school for 4 months and could read and write. The household was completed by 75 year old domestic, Annie Lynn. Percy Township, lies just in land from the northern shore of Lake Ontario, in the county of Northumberland. It was named for the wife of Hugh Percy the first Duke of Northumberland. The area was initially settled by United Empire Loyalists, fleeing the former 13 British American Colonies in the late 18th century [Wikipedia]. Noel enlisted in the 139th Infantry [Northumberland] Battalion, on 8th December 1915 [Records of the 4th Canadian Battalion]. This Battalion had begun recruiting in Northumberland County in November, eventually reaching a strength of 1153 Officers & Men. The Battalion left Halifax [Nova Scotia] aboard the s.s.Southland on the 27th September 1916 and arrived in Liverpool 6th October. Shortly afterwards the Battalion was absorbed into the 36th [Reserve] Battalion Canadian Expeditionary Force, which itself was absorbed into the 3rd Reserve Battalion the following month. Reserve Battalions fed replacement troops into front line units to make good casualties. Noel was subsequently transferred to the 4th Canadian Infantry Battalion on the 9th April 1917 [Records of the 4th Canadian Infantry Batt]. The 139th Battalion was officially disbanded in May 1917. Noel’s Temporary Grave Marker. Picture courtesy of Rhuddlan Local History Society. Disadvantage from childhood, Noel was subject to the whim of the charity charged with his care until he joined the Canadian Army and placed himself under that authority. Did he enjoy his time in Canada? Who knows, although it would seem that despite being recorded as an adopted child, his loyalties remained with Mr & Mrs Williams in Rhuddlan. “He never forgot his Welsh foster family and kept in touch with them by sending letters and postcards” [Rhuddlan in Peace & War]. It would be nice to think that they might have managed a brief reunion when his Battalion landed in Liverpool? There is a Flintshire War Memorial Record Card for Noel at Hawarden undated, but signed by the Vicar Revd. W. J. Davies, which gives Odyn House, Rhuddlan as his home address. He is commemorated on the Rhuddlan War Memorial, St Mary’s Church Window & Scroll, the RBL Roll of Honour in the Community Centre and the North Wales Memorial Arch at Bangor. 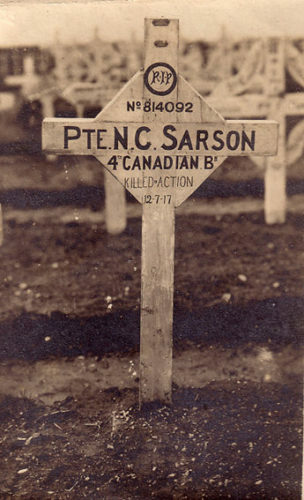 In addition he is commemorated on page 321 of the Canadian Book of Remembrance of the First World War. I am indebted to Sarah Hodnet of Rhuddlan Local History Society for her help in compiling this record.